Carnifex vocalist Scott Lewis, announces Death Dealer, his first graphic novel, via IndieGoGo campaign. Things get even darker in the city of noir with the release of Scott Ian Lewis’s graphic novel Death Dreamer: Volume 1. 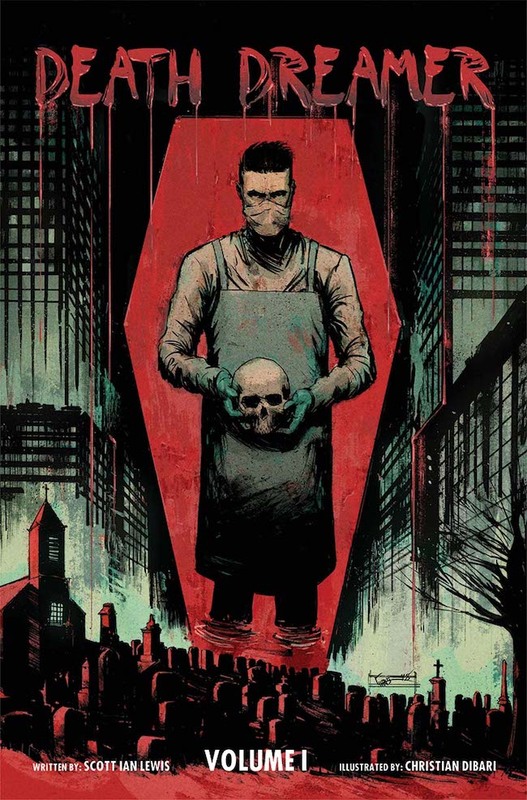 Lewis, vocalist and a founder member of the pummeling Los Angeles Death Metal band Carnifex, draws on his early experiences working in a mortuary to bring a next level “horrifically brutal murder mystery” direct to fandom. Those familiar with Carnifex’ music would expect no less. Artist Christian DiBari fills the 54 page novel with shadowy dread and bursts of fractured action, with colorist Simon Gough painting an appropriate chill over the inks. Letters are by Taylor Esposito and cover art by Chris Shehan. Death Dreamer, is a totally independent project, with crowd funding just announced today on IndieGoGo. The funding run is 38 days – ending on July 18. There are plenty of backer packages to choose from. Lewis’s one-of-a-kind world tour worn Slow Death vest has already been snatched by a lucky funder for (you guessed it) $666.00. We think the “Evidence Bag” contents, including a freakin’ toe tag, look bloody sweet. Supporters attending San Diego Comic Con can pick up their signed editions in person at the Con. Mail fulfillment with occur the same week. Here’s an overview from the author, with a look at the page art.